Read Design offers custom window treatments for any space. With a variety of styles and designs available, we will help you craft the ideal window design. Window treatments can be the main focal point of your home and can often times define the character or style of your space. This makes finding the perfect window treatment extremely difficult. Typically, you go to the store, pick out a few curtains for your home, and hope for the best. After all is said and done, you end up not liking the window treatments you picked out because they are not exactly what you had in mind. It is missing something unique and personal to you. Read Design offers custom window treatments in a variety of styles, fabrics, and colors. This allows you to be able to create that personal touch and look you have been searching all this time. Not only will you be able to find the perfect style, you will also be able to have window treatments that are functional and able to diffuse light yet still ensure privacy. Our selection of window treatments include blinds, shades, curtains, drapes, and valances. Here at Read Design, we offer several different options for window blinds and shades. Our Hunter Douglas collection provides you with unique and stylish indoor window treatments whereas our Corradi collection provides you with weather resistant outdoor treatments. These different styles come in natural, bold, modern, elegant, or a combination. Curtains and drapes at Read Design are available in a wide array of styles including classic, contemporary, dramatic or simple. We make it easy for you to customize a window treatment to be detailed and color-rich, cool-toned and natural, or a combination of the two. You are sure to get exactly what you're looking for with our custom handmade draperies. 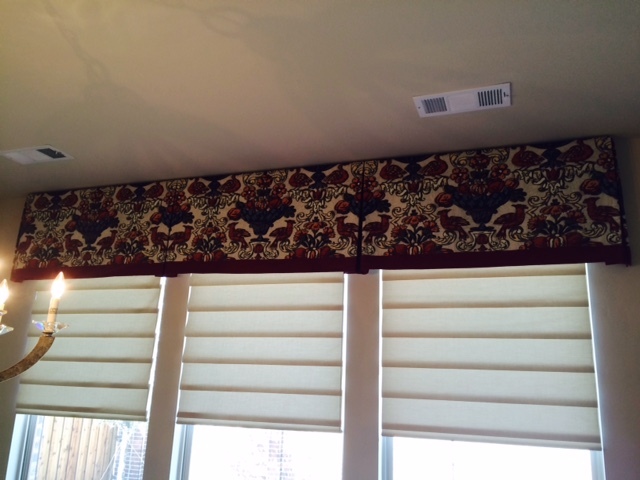 Using top window treatments, such as a valance, in a home can add warmth and style to any room. Use a fabric that is fun, fresh and stylish to frame the top of your window - this will really make a statement! The fabric of your window treatment can make a huge difference in aesthetics and style. We have a huge collection of fabrics including Fabricut, Trend, JF Fabrics, Kasmir, Kravet, Maxwell Fabrics and more. You can go with a light, sheer fabric that allows natural light to shine through to a dark, heavy fabric that blocks out the sun rays and provides maximum darkness. All of our window treatments are made by hand with the highest quality materials and will add a personal touch to the interior design of your home. Contact us today to learn more and let us help you find your perfect custom window treatment. We look forward to working with you!